“By 2020 mental ill health related problems will be second to heart disease as the leading contributor to the global burden of disease (World Health Organization)”. In the mental health section of the World Health Report 2001, it states that four of the ten leading causes of disability worldwide are neuropsychiatric disorders, accounting for 30.8% of total disability and 12.3% of the total burden of disease. This latter figure is expected to rise to 15% by the year 2020.The rise will be particularly sharp in developing countries, primarily due to the projected increase in the number of individuals entering the age of risk for these disorders, as well as a result of social problems and unrest, including the rising number of persons affected by violent conflicts, civil wars, displacements and disasters. If we take depression as an example, which is currently ranked fourth among the 10 leading causes of the global burden of disease, it is predicted that by the year 2020 it will have jumped to second place. Major depression is linked to suicide. Most people who commit suicide are also clinically depressed. If we take suicide into account, then the already huge burden associated with depression will increase exponentially. “From referral to treatment, access to mental health services – the 18 week starting clock, (source; NHS constitution)”. If you’re referred by your GP for a physical or mental health condition, you have the right to start non-urgent, consultant-led treatment within statutory maximum waiting times, ie, you have the legal right to prescribed services within those stated time limits. This right only applies to services commissioned by the NHS in England and doesn’t include public health services commissioned by local authorities, maternity services, or non-consultant-led mental health services. Your waiting time starts from the point the hospital or service receives your referral letter, or when you book your first appointment through the NHS e-Referral Service. Your waiting time ends if a clinician decides no treatment is necessary, you decide you don’t want to be treated, or when your treatment begins. Depression is one of the most common forms of mental illness. Its effects can spread into all dimensions of a person’s life including their work, home and social environments. Possible triggers identified for development of this illness include unemployment, redundancy or the threat of it, and financial difficulties. A poor working environment and social isolation are also factors which heighten the risk of depressive illness. 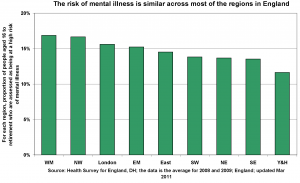 The graph indicates that mental illness is far greater where the level of household income is lower.